The loveliest book of jungle fun since Rumble in the Jungle – and no wonder! 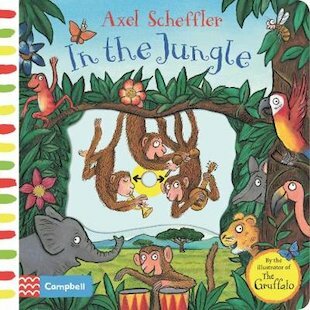 It’s created by Axel Scheffler, who did the pictures for The Gruffalo. If you know that book, you’ll know how much he loves to draw trees and forests. So just imagine how much fun he’ll have in the jungle! And best of all – so will you! You won’t just look at this rhyming book, however gorgeous and jewel-like it may be. You’ll actually take part in the story! You’re going to pull out the sliders, push out the tabs and count all the jungle animals. How many zebras are skipping? How many lazy lions are yawning?